Synonym of baseline, but may be preferred when speaking of a whole page of writing, as opposed to a student's practice sheet. The imaginary horizontal guideline marking the farthest distance between the baseline and the top of a letter. 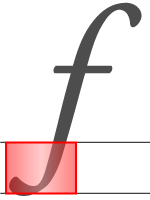 The imaginary horizontal guideline that represents the bottommost point of a descender. The imaginary horizontal guideline that represents the topmost point of capital letters. [NOTE] In many typefaces, placed below the ascender line. The imaginary horizontal guideline on which the bottoms of letters without descenders optically range. [NOTE] In most typefaces, the descenders on letters extend down below the baseline while curved or pointed letters extend ever-so-slightly below the baseline. The imaginary horizontal guideline that represents the topmost point of an ascender. [NOTE] In many typefaces, placed above the capital line. A part of a letter that extends above the mean line or below the baseline. Ascenders and descenders. The partor area of certain lowercase (or uppercase in some typefaces) letters letter that extends below the baseline. [NOTE] In an italic style etc., lowercase f often has a descender. The part or area of certain lowercase letters that extends from the mean line to the ascender line. [NOTE] The letter t, which has a shorter projection above the x-height, is often not classified with other ascending letters.